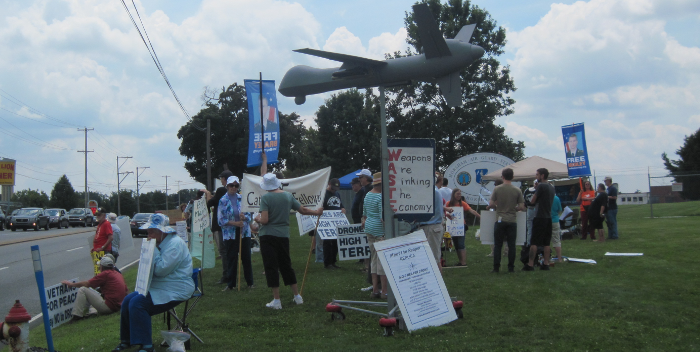 The July anti-Drone Command Center at the Horsham Air Base was an energetic one. We had probably around 80 people there. Well, the good news on drones is that from a high of 122 drone strikes in 2010 (Mostly in North and South Wazaristan, in Pakistan, right up against Afghanistan) to a mere 16 strikes in 2013 so far. There's our drone model, flying above us just as the real ones do. MIRANSHAH: Eight persons were killed when a US drone fired two missiles at a house in the mountainous Shawal valley of the North Waziristan tribal region on Sunday. Tribal sources said the drone hit a three-room structure where some people, suspected to be militants, were having an Iftar dinner.There was also speculation that four of the slain people were foreign fighters. 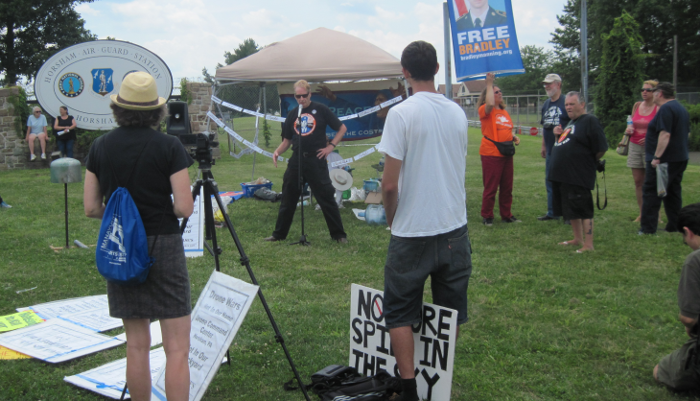 We had a speaker giving us the details on the Bradley Manning trial. We just a had what we hope was the last demonstration on his case yesterday. Our local chapter of the Granny Peace Brigade did a song for us. Seond person from left is John Grant, of the local Veterans for Peace. Next to him is Bill Perry, of the Delaware Valley Veterans for America, with his Vietnam Veterans Against the War t-shirt on. 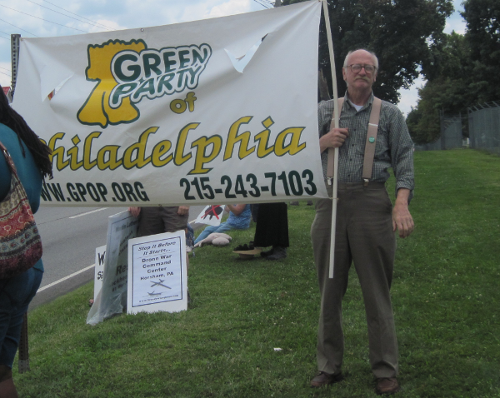 Here's Chris Robinson of Philadelphia's NorthWest Greens. He made a short speech later where he claimed that, just as with the Iraq War, the major political parties are keeping their distance from protests against it. The Green Party is the only one that regularly shows its flags and banners at anti-war demonstratins. And here we are from halfway across the street. 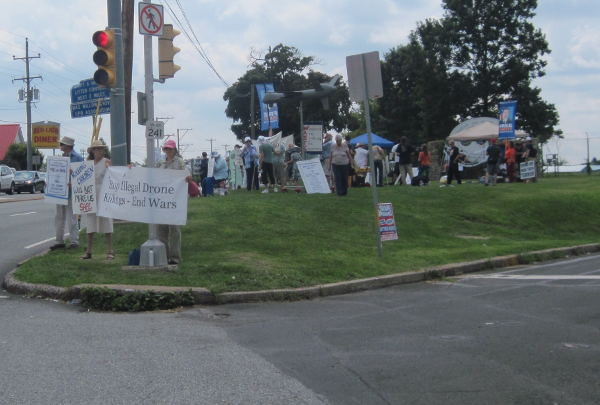 The Coalition for Peace Action and Brandywine Peace Community are sponsors of the monthly action. The Facebook page is here.